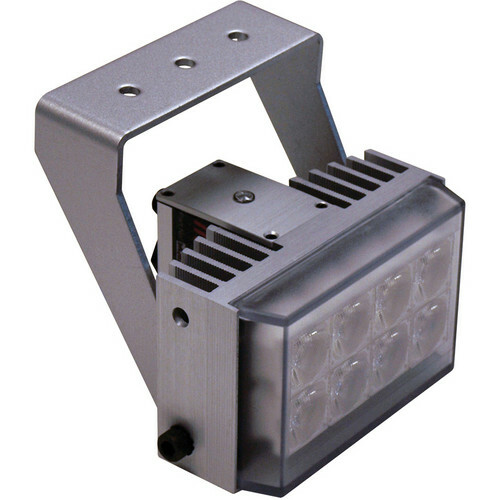 The silver WL105 Series Short-Range White Light Illuminator from Iluminar is a visible light illuminator for color CCTV cameras. This illuminator features high-power SMT (Surface Mount Technology)-enabled LEDs with current-limited integral control circuitry. It provides illumination up to a distance of 43' (13m) and offers an illumination angle of 60°. It also has a built-in photocell and comes with a wall mounting bracket. The IP67-rated and vandal-proof illuminator can be used outdoors. The hardened housing provides protection from harsh weather conditions and rapid temperature variations ranging from -58 to 140˚F (-50 to 60˚C). Box Dimensions (LxWxH) 12.0 x 8.0 x 8.0"